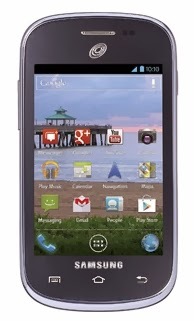 First, it is pre-paid, no contract Smartphone sold by Wal-Mart under the "Straight Talk" brand. Straight Talk has been around quite a few years. It is actually a Trac-fone company. Trac-fone also owns Net10. Trac-fone is an Asian Indian company. We used them about ten years ago. Their customer service is a lot better now. The Straight Talk Samsung S738C Prepaid Smartphone runs on the Android 4.0 (Ice Cream Sandwich) OS. With a talk time up to 7.22 hours, this Straight Talk Samsung Galaxy Centura Smartphone can keep you connected throughout the day without constantly recharging. Capture pictures and videos with the 3MPl camera and video recorder when you insert your own microSD card, up to 32GB. Prepaid Straight Talk Samsung Galaxy Phones are WiFi and 3G connected, so you can enjoy your favorite websites, videos, games and music on the go with this 3.5" touchscreen. On Black Friday, the day after Thanksgiving it came up for sale for $30. We were able to buy it online and have it delivered free to the Cottonwood store. Saving $70 is always an attractive alternative. We waited until Susun's T-Mobile prepaid minutes were about to run out and then activated the Smartphone with a $45 per month plan that provides unlimited talk, text and data. Verizon is carrying the primary signal for this phone. 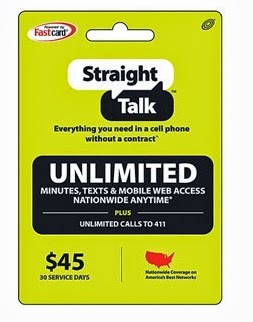 Straight Talk phones use a variety of carriers, as many as four. We're lucky to have Verizon carrying this particular phone as their signal is very strong in our area here and also in Idaho. The biggest glitch so far has been the set up of the voice mail. Susun tried for many days to get it set up with no luck. The morning of January 31, we spent several hours online and on the phone trying to solve the problem. The problem was finally solved. The primary reason for going with a low cost prepaid phone was to see if Susun would "like" the Smartphone and be able to use its many features. So far, she has learned many of the features on her own without assistance. She appears to "like" the phone very much. We will definitely now consider perhaps a more expensive phone and a more expensive monthly service plan as well. There really was no point in signing onto a two-year agreement until we know that she would actually like and use a Smartphone. John has no interest in owning or using a Smartphone. Susun wants the Smartphone so she can post pictures to Facebook and also to text with easier testing technology. John will continue to use an ancient flip phone on T-Mobile prepaid. His plan provides 1500 minutes for $30 a month. He generally uses only about 300 minutes but there is no cheaper plan to suit his needs. That's the exact phone Kate got for Xmas, only hers is a Tracfone. It's triple minutes under tracfone service. She loves it. I'm thinking of getting one too. Contracts are for chumps.